A small corner shop in rural Australia, Denilquin, New South Wales to be precise. A simple building as you would expect currently occupied by Barlow & Weller's Pharmacy. But the roofline has that extra Art Deco something. 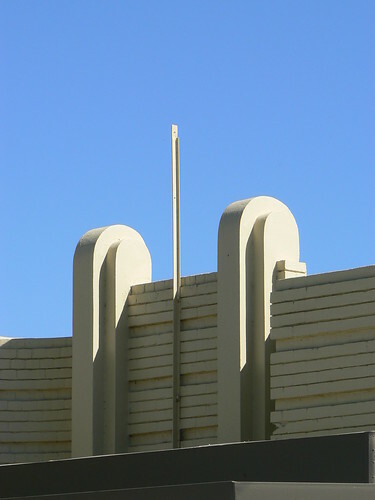 Horizontal bars curving around the corner and two rounded pylons marking the entrance. Nice. Very nice indeed! 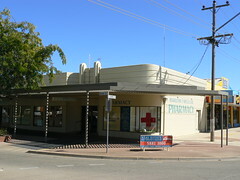 It may not look like a big city bank, but perhaps small corner shop is all that a rural Australian town required. And it is still beautifully preserved.